Preview video ratings on YouTube. Is there a better alternative to YTShowRating? Is YTShowRating really the best app in Video category? Will YTShowRating work good on macOS 10.13.4? YTShowRating is a YouTube utility that helps you quickly identify related videos that are actually worth watching. 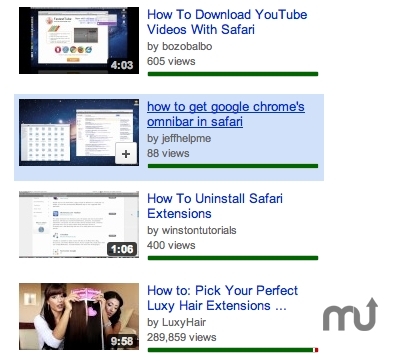 Chrome, Firefox and Safari: Related videos! They're useful, but can often have misleading thumbnails or text, designed to get you to click when you have no actual interest in the video content. It'd be nice to see the ratio of likes to dislikes on the video before you go in, right? Now you can. Version 1.0.5: Release notes were unavailable when this listing was updated. YTShowRating needs a review. Be the first to review this app and get the discussion started! YTShowRating needs a rating. Be the first to rate this app and get the discussion started! Redditor bmacs has this extension, explained in the above video, and it does exactly what I just described. You get to see the like/dislike ratio in a bar under each video so you can know what you get before you click. This depends heavily on the video being old enough for it to get a fair number of ratings, but which I think is a pre-requisite of sorts for a video to be a recommended related video. This extension doesn't guarantee you'll never click on a video you don't like, but it does lessen the chances of it, just like cooking your meat thoroughly lessens the chances of you seeing that meat again before the proper amount of time has passed.